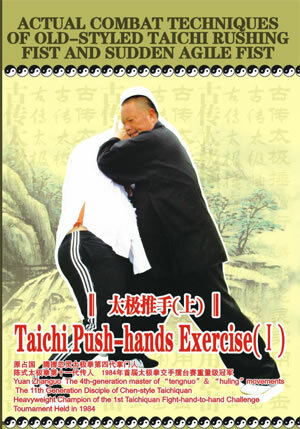 Taichi Push-hands Exercise is a duel event between two bare-handed people, and therefore has a feature of duel between two opponents. Following and sticking, up and down going together, neither loosing nor goring, circling and turning, avoiding the main forces and striking the weak point, persisting instead of prompting, this exercise draws on these basic techniques of grasping, catching, throwing, hitting, warding, deflecting, pushing, pressing, elbowing and leaning, etc. to take preemptive steps in fighting the enemy. This exercise is explained by Yuan Zhanguo who is a master of Taichiquan. You'll get to know the essence of Taichi Push-hands exercise by enjoying the real pitched play of our program.